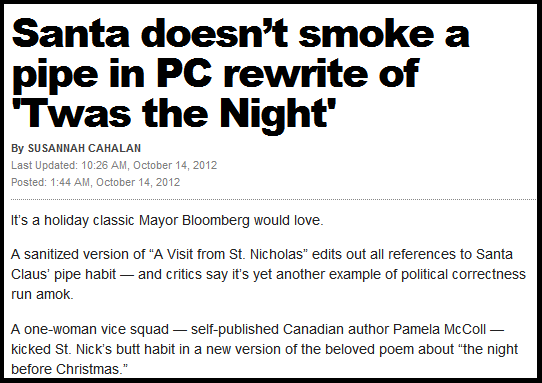 Some woman spent $200,000 dollars of her own money to have "Twas the Night Before Christmas" rewritten with the entire section about Santa smoking a pipe removed. 2) Can I borrow some money? You will see in my new version that Santa is now pretty jacked and not a big obese guy that would normally be charged with home invasion. Merry Christmas, Happy Hanukkah, etc. etc. to you all. Seriously. That's damn near perfect! Sad, but perfect. That is ABSOLUTELY the best version I've ever read!!! The dryer wasn't broken, this PC family is saving energy for the holiday season. Lovely poem, warms the heart! Merry Christmas. Perfect reading for my night. This is fantastic! I found you from your comment on The Bloggess. Since you have a ”share” button on your blog, I assume you don't mind if I put a link to this post on Facebook. I hope the toys he brought were gender neutral! Yeah that was pretty f'ing awesome.